Ernest Kingshott Whitehead aka Mick Whitehead was born on the 27th February 1909 at Gisborne, New Zealand. The only son of Ernest William Whitehead of Dannevirke, NZ and Edith Mary Kingshott of Black Hills, Tasmania. His parents had married the year before. Mick also had a younger sister, Edith Molly Whitehead born in Tauranga NZ a few years later in 1916. On Mick’s birth certificate, it states that his father was Ernest Whitehead, Labourer, 23 from Waipawa in New Zealand. His mother, Edith Mary Kingshott, 22 from Newfolk in Tasmania. Reported incorrectly of course because she was from Norfolk. Bit of a typo there from the clerk. It’s unlikely that young Mick knew but he was descended from a line of real fair dinkum pioneers. His childhood was likely quite similar to those of the other children of the time growing up in one of Auckland’s earliest inner city areas. Indeed for the time he and his sister made up what was considered quite a small family. 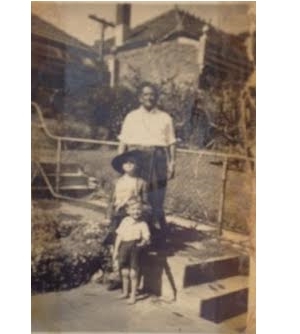 In 1914 Mick and his parents were living in Tauranga Bay where his father was a fruiterer. Two years later in 1916, his younger sister Edith Molly was born. By 1928 at the youthful age of nineteen, Mick had joined the Royal New Zealand Navy. (Sailor with the RNZN. Citizen of New Zealand. Passport 10186). It was around this time that Mick was shipped to Australia with the navy. The following year on the 26th October 1929 Mick was based in Sydney and married Dorothy Mary Eila Taylor at the Soldiers Settlement Church in Matraville, NSW, Australia. Mick’s sister and parents had also come to Australia to live by this time. Molly was the bridesmaid at their wedding. Goulburn Evening Penny Post, 12 November 1929: WHITEHEAD-TAYLOR St. George’s Church, Matraville was prettily decorated by friends of the bride on October 26, when Dorothy only daughter of Mr. and Mrs. Fred Taylor, of Romain Parade, Matraville was married to Ernest, only son of Mr. and Mrs. Whitehead, of Sydney. Rev. Phillip Westley officiated. The bride, who was given away by her uncle, Mr. Jack Evans of Goulburn, wore a gown of crepe satin. Her embroidered tulle veil was held in place by a coronet of orange blossoms and formed a train. She carried a shower bouquet of white roses, carnations, and orchids with streamers. Miss Mollie Whitehead, sister of the bridegroom, was the bridesmaid and wore a lemon georgette gown, made with a peacock skirt and trimmed with silver lace. She wore a picture hat to match and carried a shower bouquet of yellow roses and orchids. Mr. Aubrey Robins was best man. The reception was held at the residence of the bride’s parents. The bride’s mother received the guests in a gown of Lida blue morocain, heavily beaded, and carried a posy of roses. Mrs. Whitehead traveled in a blue crepe de chine suit with hat to tone. Mick had been in service on-board the HMS Diomede (D92) and was a Stoker in the New Zealand Division of the Royal Navy. The NZDRN was the precursor to the Royal New Zealand Navy which became its own entity in 1941. On the 19th February 1933, Mick’s nineteen-year-old sister took her own life by strychnine poisoning with a coronial inquest held on the 21st Feb 1933. She died at the Shoalhaven Private Hospital in Nowra. It stumps my mind as to what bad shape Edith Molly must have been in to take her own life, especially by such a painful means. The effect this must have had on her family is heartbreaking to consider. If life was hard for the Whitehead’s following her death it was about to get worse. Not quite two years later, Mick was helping his father fell trees on Ernest William’s property at 56 Illaroo Road Cambewarra when his father felled a tree which fell badly. The tree trapped and pinned Ernest who later died as a result of his injuries. The coronial inquest was held 27th July 1935. Mick and Dorothy went on to have four children together. Two boys and two girls. They resided in Australia throughout this time and I have no records of Mick having returned to New Zealand after this time. By 1930 Mick’s address is given as 92 Devonshire Street, Foveaux, West Sydney, New South Wales. During his life, Mick had quite a few brushes with local constables. He wasn’t a bad sort he just wasn’t in a hurry to be a vigilant rule follower. This was evident on 25th October 1935 in the Nowra Leader (Police Court); Ernest K. Whitehead was charged with totaliser betting. Sergeant Standen stated that Sergeant Breeze found defendant betting in the Hotel Nowra; defendant admitted that £1/11/- of the amount of £7/14/-found on him was betting money. Fined £5 and £1/11/- costs. He was allowed six weeks to pay. Mr. Manion appeared for the defendant. The Magistrate intimated to the defendant that if he came up again before the court for a similar offense the penalty would be increased considerably. Then again on the 24th April 1946, in The Sun. “Vacant” Sign On Taxi, Driver Fined Ernest K. Whitehead, taxi driver, of Murray Street’/ Bronte, was ‘fined £3, in Paddington Court today for failing to obscure the vacant sign on his taxi cab when it was not available for hire. Police Prosecutor, Sgt. Lucas said that Whitehead was driving in Oxford-street, carrying passengers in the rear seat. The vacant sign was still showing. Mick would appear in court a number of times during his taxi cab driver career, things like driving in a prohibited area, exceeding speed limits, etc. I guess if you did that as a career your likelihood of getting pinched for something was a lot higher. During his early years, the census records show Mick was involved in many different works. A mixed business owner, grocer. In Illaroo Road (Strawberry Hills) Redfern New South Wales. During these years he was also a manufacturer of bathing soaps and detergents in Cleveland Street, Redfern. What I do know is that Mick did not go to war during WWII. In 1943 in Western Sydney, Mick and Dorothy divorced. Mick later remarried Neva Irene Helmrich (Miles) at the Registry Office in Waverley on the 8th November 1946 at the age of thirty-seven. He and Neva had two boys together. During this time Mick also had his children from his first marriage living with him along with Neva’s son from her first marriage and their two children together. 21 March 1946, Sydney Sun. Mick must have been feeling a bit sentimental because he put this letter through to the paper. It couldn’t have been for his or his wife’s parents as they were all either deceased or local. Back To England? Britishers who have resided In Australia 30 years, and are now 60, or over, should be offered the privilege of a free or assisted passage to their homeland. Many would like to see again the familiar places of their youth but have no hope of seeing England without assistance. It would be a wonderful gesture were this ‘ opportunity afforded them.— Ernest Whitehead; Woy Woy. From 1949 through to 1958 Mick and the family were living at Bronte where Mick had a taxi cab and was an owner/driver. Family lore told of the time that the tax department caught up with Mick as he’d failed to put in tax returns for most of these years. Reportedly it ended up being quite an expensive exercise for him. Mick with youngest sons at Bronte. The photograph was taken by Neva. During this time Mick’s favourite hobbies included spending time at the racetracks around Sydney. This love of the horses remained with him for the remainder of his years. 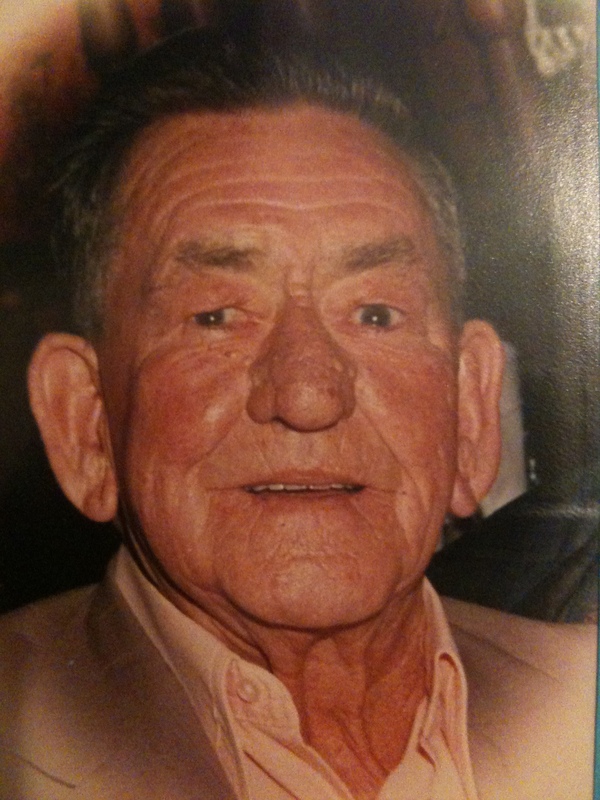 Apparently, he loved a game of two up and was good friends with a colourful jockey called Teddy Doon in Sydney. Doon was known to argue with the stewards at the racecourse on a regular basis. By the 1960s Mick and the family had moved to Saratoga near Gosford where Mick and Neva had a petrol station and also a camping ground and caravan park. (7 Bay St Saratoga). Mick and Neva had bought up quite a bit of land along the Brisbane Waters which they eventually sold off. The 1980 census shows Mick and Neva as living at their last home together 7 Steyne Road Saratoga. When we used to visit there as children the house really was a bit of a shack. But it was right on the water’s edge and the view was fantastic. Looking at the same property many years later there appears to be something of a mini-mansion set back from the road with a tennis court and swimming pool. Darn; it would have been good if Pop had had those things in place when we were kids. I wonder if the owners know that there used to be a terrifying thunder-box out the front of the house next to the driveway. Right about under their house, I think. The last time I saw my grandfather was earlier in 1987. A few months later he was hit by a bus. (It could only happen in our family). He died a few days later in hospital. A coronial inquiry following death. Was hit as a pedestrian in a vehicle accident (bus) on the 24th August 1987. Mick died on the 5th September at Woy Woy Hospital a pretty rough ending for anyone. My memories were that he had a reasonably good sense of humor, a down to earth sort of bloke. From my perspective, he was the kind of fellow you’d expect to see down the local who could tell you a good story and have a bit of a laugh with. He’d for sure have had the next hot tip for the races. He believed solidly in entering the lotto and figured you had as much chance of winning as anyone else. I think he probably was always looking for the next best opportunity and I guess he enjoyed his life on his own terms.